The famed Maracanã stadium, which was given a $600 million retrofit to host the finals of the 2014 World Cup and the soccer gold medal matches at the Olympics, has fallen into a state of extreme disrepair. There is patchy grass, thousands of missing seats, and festering mold, among other problems, with the Rio 2016 organizing committee saying there are still some repairs it must do. But at least club football is still ongoing in the stadium—and it hosted a Chapecoense benefit match last month—so there is a chance things will be fixed. That’s better than can be said about most other Olympic venues. Barra Olympic Park, the complex of nine venues (two of them temporary) that hosted a huge portion of the Games was supposed to be auctioned off. But when the auction only drew a single bidder—who couldn’t meet the stipulations—it was cancelled, and the venues turned over to the federal government. It is unclear how they will be used, and who will control them long-term. Deodoro Olympic Park, which is far away from the Rio city center and hosted events like rugby, field hockey, and equestrian, was returned to a public park after the games. But it was closed at the start of the year, when the company managing it shut down. It’s unknown when, or if, it will reopen. The $19 million Olympic golf course is falling into disrepair, as it struggles to pay for maintenance and salaries of workers. The problems are obvious and were known well before the games—few Brazilians play golf, and even fewer can afford expensive greens fees. 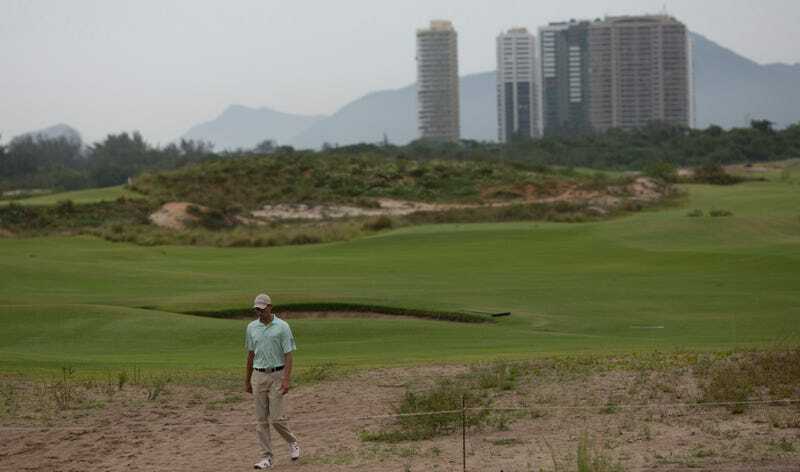 Rio had two existing golf courses that could’ve been used for the Olympics, but built a brand new one instead. Finally, the $65 million Complexo do Alemão cable car—one of those Olympics-related infrastructure projects meant to help residents long after the athletes leave—closed last year, after the state stopped paying the company operating it. According to the Associated Press, in total Brazil spent $10 to $12 billion on the Olympics (and a similar amount on the 2014 World Cup). The government is considering extreme austerity measures to combat the country’s economic crisis. Rio de Janeiro public workers—many of whom haven’t been paid in months, and are seeing basic social services slashed—are out in the streets protesting. I wonder what they think about the Olympics golf course.